The Siege of Gloucester 1643 has been claimed to be a pivotal point in one of the most important events in English history: the English Civil War. Gloucester sided with the Parliamentarians leading to the city being besieged by Royalist troops commanded by Charles I. Today few reminders of this stirring event remain. 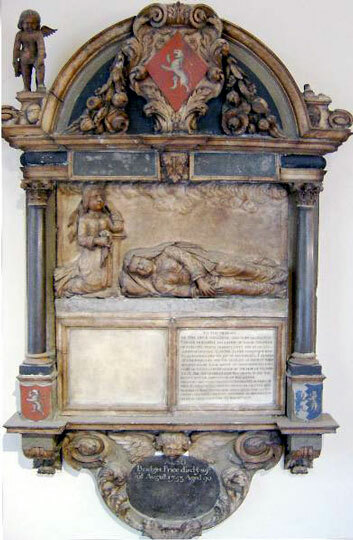 There is however a large baroque monument to Major Thomas Price, a Royalist officer, the only monument on the north wall of the chancel of St John’s church in the city. It is believed that the monument is by one of the Reeves, the local long-established family of masons. 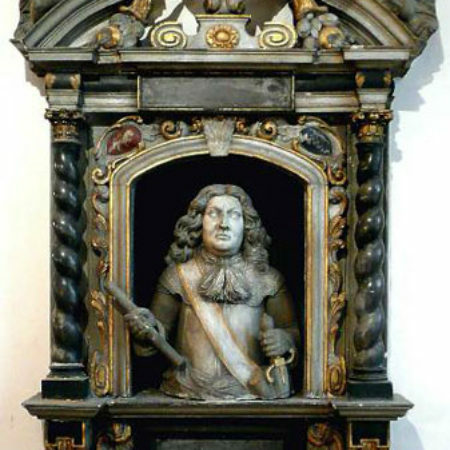 Major Price, who died in 1678, is shown as a demi-figure in the uniform of a Major of the Lancers at the time of the Civil War. His left hand grasps the pommel of a sword while his right holds the short truncheon of a commander. Above, two cherubs lean on skulls while holding laurel wreaths of victory symbolising eternal life. Between them a cartouche contains a coat of arms of Price impaling Driver. He married Dorothy, the widow of Robert Windowe of Avening and daughter of John Driver of Ashton-in-Avening, who out-lived him, eventually dying in 1722 aged 94. It has been erroneously recorded that there are also two inverted torches. These are in fact cornucopia, the usual symbol of a full and bountiful life. And what a life he had. The Latin inscription on the monument, along with a recorded inscription on a lost ledger stone, describe Major Price as alderman, twice mayor, and Major of Horse to Charles I. During the Civil War he was said to have been often wounded, and on one occasion left for dead. From other sources it is known that prior to the Siege of Gloucester he was one of the stewards of the city and his name was recorded on the list of 104 citizens of Gloucester with Royalist leanings drawn up by Sir Edward Walker, Charles I’s Secretary of State. On the outbreak of the Civil War he left Gloucester and fought for the King. He eventually returned to the city and became prominent again in local affairs, serving both as mayor and sheriff. His standing was such that he was granted the right to issue in his name a farthing token which could be used as currency within the city. 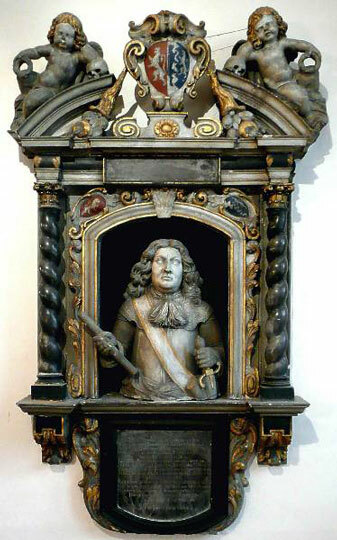 It is interesting to note that although he was mayor, sheriff and a successful business man he chose to portray himself on his monument as a Royalist officer in armour. Directly opposite the monument to Major Price, on the south wall of the chancel, is the monument to his daughter Dorothy (d. 1693), erected by a second daughter Bridget (d. 1753). 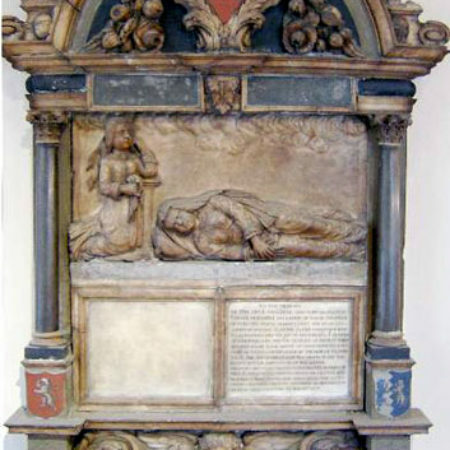 The marble monument shows Dorothy as though asleep while beside the bed weeps a second woman. Could this be Bridget? If so, Major Price has stood guard over his two daughters for over two hundred years. The Siege of Gloucester lasted 26 days from 10th August to 5th September 1643. Accurate numbers of those killed are not available. Royalists claimed to have lost 100 while the Parliamentary sources put the Royalist losses as high as 1500. By contrast the city claimed to have lost only 50 although this is likely to be a low estimate. Given the possible number of deaths it is surprising that there is only definitely identified monument to a casualty of the siege. 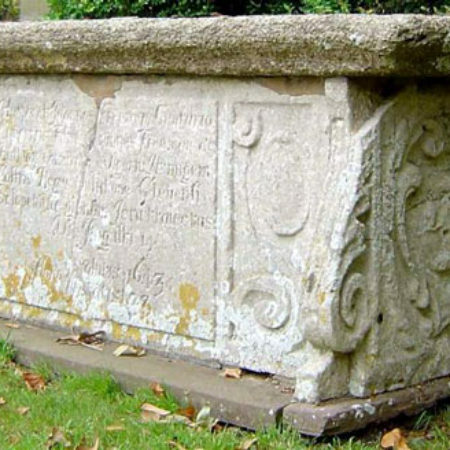 A table tomb in the graveyard of St Swithun’s church at Hempsted just south of Gloucester records the death of John Freeman. The Latin inscription states that he died, aged 23, on the 14th August just five days into the siege. It continues, “Here lieth John Freeman, Captain of horse………pierced through by the stroke of a gunner’s bullet at the siege of Gloucester, in the camp of the King”. There is no comparable monument to any of the townsfolk who were killed during the siege. Indeed only one monument is known to a member of the Town of Gloucester Regiment who fought in the siege and lived to tell the tale. This is to Thomas Pury the younger (d. 1693) who was a captain in the regiment and became an MP for the Monmouth Boroughs during the Commonwealth. 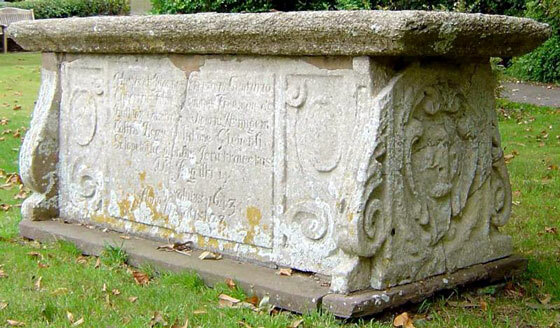 Appropriately for a parliamentarian he is buried in the churchyard of the ‘Puritan’ church of St Lawrence at Taynton. The original Norman church was destroyed during the Siege of Gloucester and the present church built in 1647-8 by an act of parliament during the Commonwealth. It is a very rare example of a church built at this time and it is oriented in the puritan fashion, north-south. The most lasting effect of the Siege of Gloucester is however what cannot be seen. On gaining the throne Charles II ordered in 1662 that the walls of Gloucester should be razed so that the city could never again defy the Monarchy. This began the destruction of the walls, and today all that remains above ground is a 4 metre long section.